THE BEST THING about the NFL is that it's not the NBA. If you're an NBA team and fall on hard times, the road back to respectability is longer than the Appalachian Trail. A fan could get caught robbing a bank, do a couple of nickels in Lewisburg and still be back on the street before your favorite team gets good enough to make it to the second round of the playoffs again. Not in the NFL, though, where they've got more rags-to-riches stories than the Pennsylvania lottery. It has become routine in the parity-filled league for teams to stink up the joint one year and make it back to the playoffs the next. So Eagles fans, take heart. 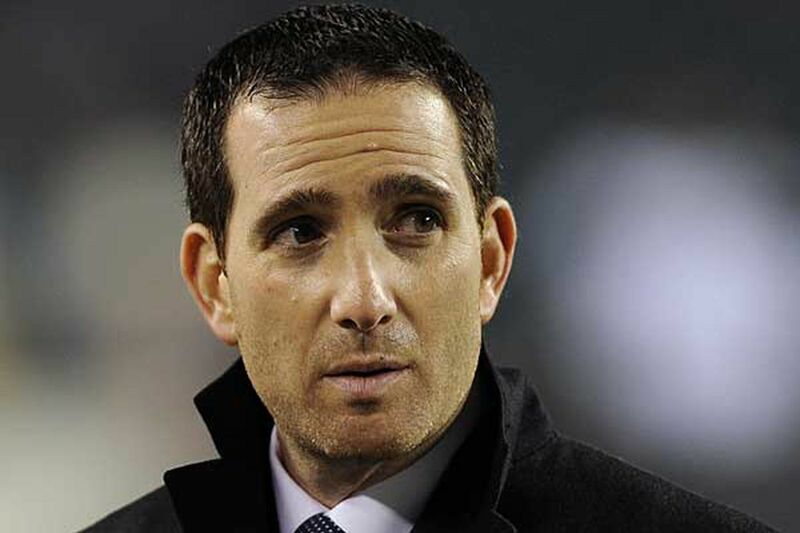 As long as Howie Roseman keeps his distance from beefy firemen, safeties from Temple and cornerbacks with pink wardrobes, your team very well could be back in the postseason next January. Seriously. In case you didn't notice, the Colts, who won just two games last season, and the Vikings, who won only three, both qualified for the playoffs this year. Yes, they both made first-round exits, but that's beside the point. Since 2002, nine of 29 teams that won four games the previous season made it to the playoffs the following year. Thirteen of those 29 managed to win at least eight games. Not since 2005 has at least one team that won four or fewer games the previous season failed to qualify for the postseason. Since 2002, 18 of 48 teams that won four or fewer games have managed to make the playoffs at least once in the next two seasons. Take the perennially bad Raiders and Browns out of the equation and it's 18 of 40, or 45 percent. Don't misunderstand me. I'm not trying to be overly optimistic you here. The Eagles have some significant roster repair work to do, particularly on defense with a unit that gave up a franchise-record 33 touchdown passes, had a league-low 13 takeaways and finished tied for 29th in the league in points allowed. Jeff Lurie has to hit a bull's-eye on his head-coaching hire, and that guy has to hire two capable coordinators, one to clean up the mess on defense and the other to continue developing quarterback Nick Foles. And, Roseman needs to come up with another solid draft and also find some serviceable replacement parts on the free-agent market. Maybe that's too much to expect. But it's what needs to be done if the organization wants to avoid its first 3-year playoff drought in 26 years. While the jury remains out on Foles, he played well enough in six starts to give the Eagles hope that he can be their quarterback going forward. That said, there still is enough uncertainty about him that they have to hedge their bet. They have to get a Plan B either in the draft or free agency. A couple of free agents to keep in mind: the Bears' Jason Campbell and the Dolphins' Matt Moore. The rest of the offense is in pretty good shape. The offensive line will be getting back Jason Peters, Todd Herremans and Jason Kelce, who missed a combined 38 games to injury. That doesn't mean you pass on the best offensive tackle in the draft, Texas A & M's Luke Joeckel, if he's there at No. 4. But either way, the line should be in fairly good shape. Assuming Bryce Brown learns how to hold on to the ball by next season, the new coach is going to have a very good running back tandem to lean on in Brown and LeSean McCoy. The receiving corps doesn't have a difference-maker, but it's an adequate group, particularly when you throw in tight ends Brent Celek and Clay Harbor. Defense is where they need to make significant improvement. You can make a pretty good case that the Eagles need to blow up the secondary and rebuild it. But that's probably not practical. They need to replace at least one of their two starting safeties. Kurt Coleman is a tough SOB who gives you everything he's got. But it's just not enough. He's not a starting-caliber player. Neither is Colt Anderson. Nate Allen has been a second-round disappointment, but he has decent cover skills. If you could transfuse Coleman's toughness into Allen, you'd have a pretty good player. This is a position they absolutely, positively need to address in either the draft or free agency, best-athlete-available be damned. Kenny Vaccaro, a do-it-all safety out of Texas, is expected to go somewhere in the mid- to late-first round. He's not somebody the Eagles would consider with the fourth overall pick, but if they traded down and acquired an extra first-round pick, or traded up with their second-round pick, he'd be a possibility. There also are several intriguing safeties who could be become free agents in March, including the 49ers' Dashon Goldson, the Falcons' William Moore, the Lions' Louis Delmas and the Bills' Jairus Byrd. They also have to figure out what they're going to do about cornerback. Both Dominique Rodger-Cromartie and Nnamdi Asomugha were major underachievers last year. DRC is going to be a free agent. Asomugha is due $15 million next season, though you have to believe he almost certainly would be willing to restructure his deal given how badly he played last year. The Eagles could show both guys the door. But a more likely scenario would be keeping Asomugha at a reduced salary and letting the flaky Rodgers-Cromartie walk. The top-rated corner in the draft at the moment is Alabama's Dee Milliner. As with Vaccaro, the fourth pick would be too high to use on him, but a trade-down always is a possibility. Rookie Brandon Boykin, who played nickel all season, could move outside if the Eagles don't re-sign Rodgers-Cromartie or release Asomugha. But his size - he's only 5-9 - is a concern, even with a 40-inch vertical leap. Some potential free-agent corners: the Falcons' Brent Grimes, the Bengals' Adam Jones, the Lions' Chris Houston, the Broncos' Tracy Porter, the Cardinals' Greg Toler and Michael Adams and the Bengals' Terence Newman. What the Eagles do up front and at linebacker will depend on what kind of scheme they end up playing in 2013. Assuming they stay, at least structurally, with a 4-3, they could use help at both end and tackle, and need to find a better SAM-linebacker-option than Jamar Chaney. That's a lot of offseason work for Roseman and his scouts. But if they make enough correct decisions - and yes, that's a big if - another quick NFL turnaround isn't out of the question.